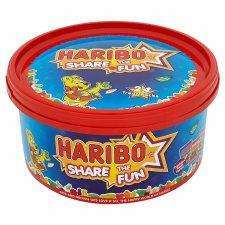 Large 720g Tub Of All Your Haribo Favourites - Contains A Selection Of Treat Packs Of Starmix , Tangfastics & Supermix. It's Christmas so it's OK for kids to eat tonnes of sweets, right? While the adults dive into the tub of Celebration chocolates the kids can share this huge box of Haribo. Sorted. This Product Is Available For Delivery Between Wednesday 10th October to Monday 24th December. Often says that until they update the website.